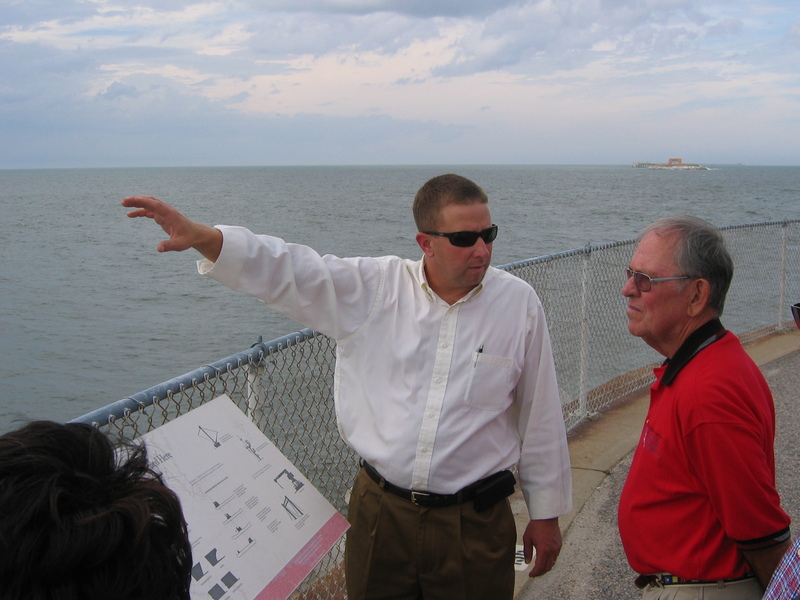 Tuesday, September 6, 2011, promised to be a memorable day what with the tour by our US Coast Guard Auxiliary Cape Charles 12-02 Unit of one of the great engineering marvels of the modern world, the amazing 17 mile long Chesapeake Bay Bridge-Tunnel complex. 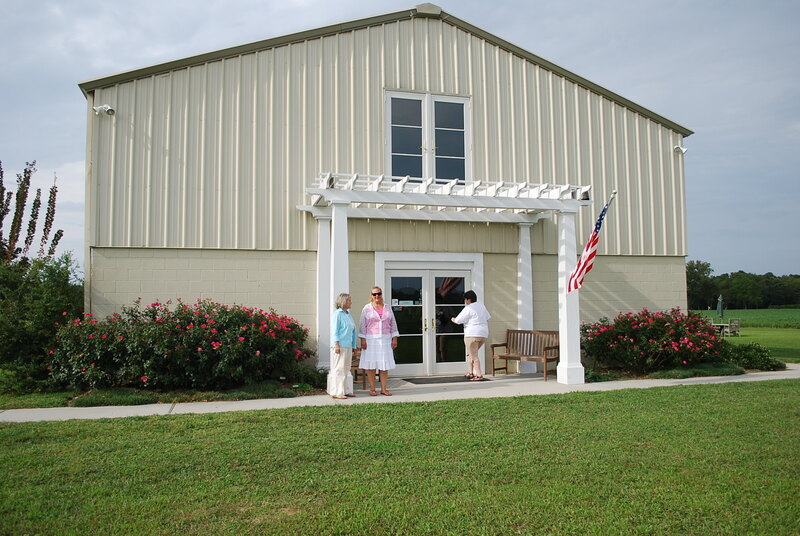 Our group gathered at the north end of this transportation wonder which is so important to the economy of the Eastern Shore of Virginia as it connects our area, which is the southern tip of the DELMARVA peninsula, to the mother ship, mainland Virginia. There we all were ushered into the wood panelled meeting room of the complex’s Board of Directors and seated in plush leather swivel chairs at an immense, polished mahogany conference table where we were warmly greeted by Mr. Jeff Holland, the executive director of the complex and his assistant Paige Addison. Jeff took great pains to explain to us the history of the Bridge-tunnel from its inception all the way through its construction, carefully illustrating with a slide show its ground-breaking engineering. As well, we learned about its ongoing maintenance, its operation, considerations for future improvements, its funding and security issues. As one who has driven across this complex countless times, even during extreme weather events and electrical outages, and even having been rescued by their emergency personnel, I was amazed by the quality and quantity of new information I gathered. Jeff Holland, Executive Director of the CBB-T, points out the Thimble Shoals Channel of the bridge-tunnel to Milton Hickman, son of a former longtime director of the complex. Our group was then given toll passes to allow us to travel south over the bridges and through both tunnels to park on the first island near the restaurant and visitor’s center. Jeff took time to point out the massive construction of the islands and the bridge trestles, and pointing out to us the shipping channels that the underground tunnels span. Observation points on the island afford visitors and travelers an incredible perspective of the mouth of the Chesapeake Bay where it meets the Atlantic Ocean. Also, there is a fishing pier that has special lighting underneath that attracts schools of bait fish to the surface, making the pier a great attraction for fishermen casting from the pier above them. While we were observing this incredible scene, Jeff pointed out to us a very special ship making her way east through the Thimble Shoals Channel. She is the USS New York, a US Navy warship, which was built with steel salvaged from the site of the World Trade Center after its destruction on September 11, 2001. How poignant that we should be touring this facility just a few days before the tenth anniversary of that event just as she was passing by. USS New York passes through the Chesapeake Bay Bridge-Tunnel on her way to the tenth memorial anniversary of the destruction of the World Trade Center on Sept. 11, 2001. Next, our group was lead into the garage bay of the island’s ventilation and maintenance building where we were informed by the director of safety, Mr. Jim Davis, of how the public is protected by their extensive traffic safety procedures and response to breakdowns and accidents. 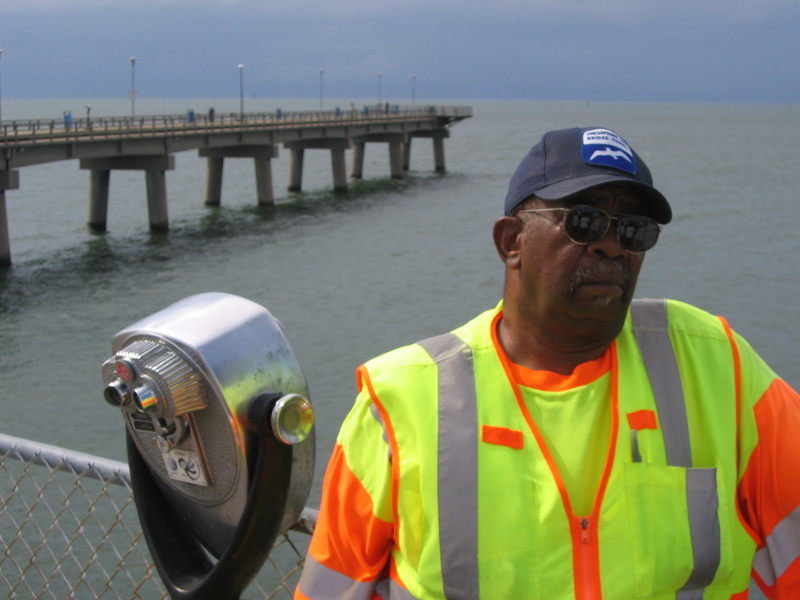 It seemed that every conceivable emergency has been considered and planned for, which spoke so highly of the professionalism and dedication of the employees of the Bridge-tunnel. Traffic Safety Director Mr. Jim Davis, in front of fishing pier, explains the complex's focus on safety.Inside the ventilation and control b uilding on the first island. After a most interesting, as well as reassuring, explanation of the Chespeake Bay Bridge-Tunnels traffic safety and engineering standards, our group was then ushered into the ventilation area where we got our exercise for the day by descending five stories down to the level of the underwater/underground tunnel crossing beneath the Thimble Shoals Channel. It was explained to us that the tunnels were engineered to allow for open shipping channels into the world’s largest naval base in Norfolk, VA, which could be especially critical in a time of war. A bridge could be destroyed and thus block such channels, but not the underground tunnels which would always be open for the Navy’s ships. Mr. Tee Wells, a superintendent of the facility, escorted us through a steel door in the thick concrete walls that lead us onto the sidewalk in the Thimble Shoals tunnel. The noise of the traffic was amplified and reflected by the tunnels walls, especially loud when an eighteen wheeler passed by. 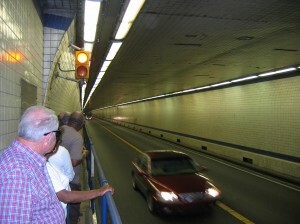 Standing on the walkway next to traffic in the Thimble Shoal tunnel. Re-climbing and catching our breath, our group re-entered the ventilation building with a big sigh of relief. And then we climbed one more story up where we could walk above the tunnel’s traffic lanes in the ventilation shafts. Ventilating the tunnels is essential to removing the carbon monoxide produced by the traffic and the huge fans exchange the air every few minutes. Up in the ducts above the tunnels, the space is pitch black dark but through the vents in the ceiling, we could watch the traffic passing below us! Finishing our tour of the ventilation works, we then entered the secured control room where an experienced operator is on duty 24 hours a day, all year round. The operator has at his command a dozen monitors that give him a view of all areas of the tunnel’s roadway, the ventilation buildings and the parking lots on the island. There we were given an exciting overview about the complex’s very high security standards and abilities. Let’s just say that the war on terror is being fought right here at home and that this world class transportation facility is right in sync with detailed guidelines and high standards of terrorism awareness and facility protection. And after learning so much about the operations of the Bridge-tunnel complex, I shall definitely feel even more safe each and every time I cross this increadible engineering achievement. 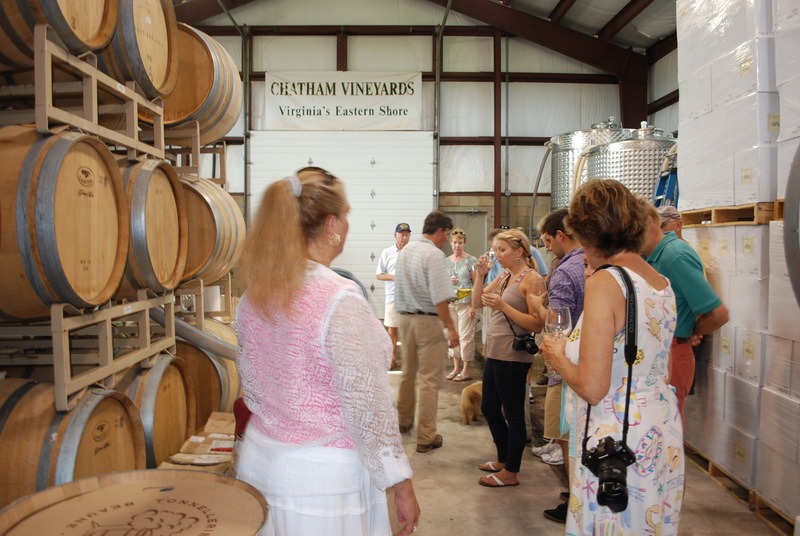 A few weeks ago my daughter, a friend and I spent a lovely few hours touring Chatham Vineyards located in Machipongo, VA on the Eastern Shore, learning about the art of growing grapes and sampling some of Chatham’s delicious wines. 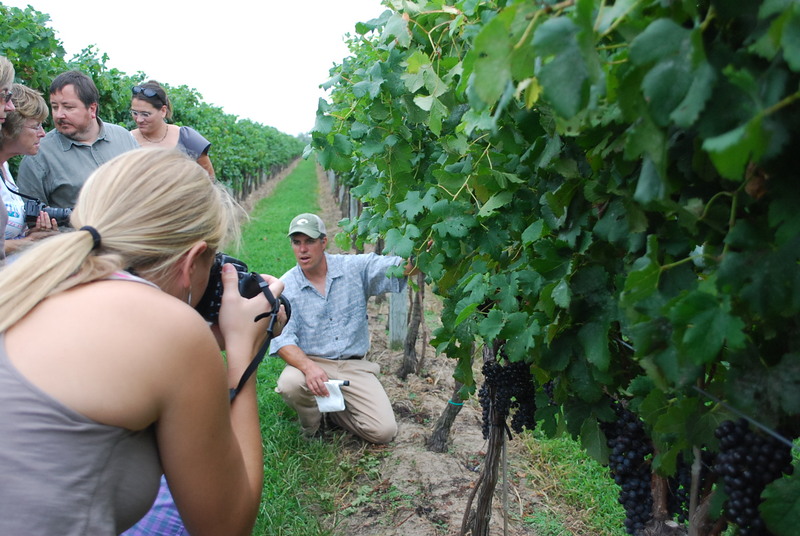 Owner Jon Wehner started our afternoon off with a leisurely stroll through the vineyard itself, explaining the vineyard’s seasonal activities, which was quite engaging. 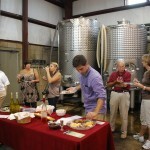 I have been fortunate to have done the “Tour & Taste” at a number of wonderful wineries but this was my first extensive tour through a vineyard and I think everyone in attendence found it quite interesting. Definitely the perfect time of year for it, the colors were beautiful. 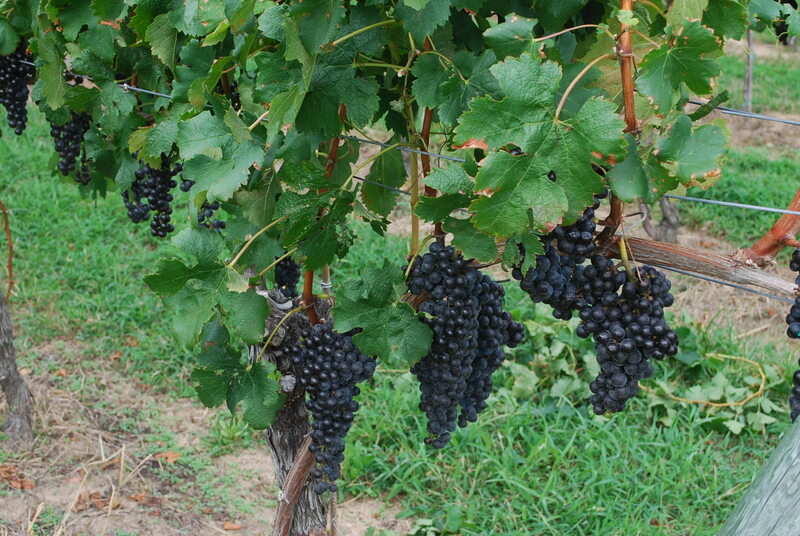 In sharp contrast to the deep green of the leaves, row after row of compact bunches of black and purple grapes glistened in the sun, plump, juicy, nearly ready for harvest to begin, no doubt a vintner’s favorite time of year, the sweet culmination of a great deal of work. 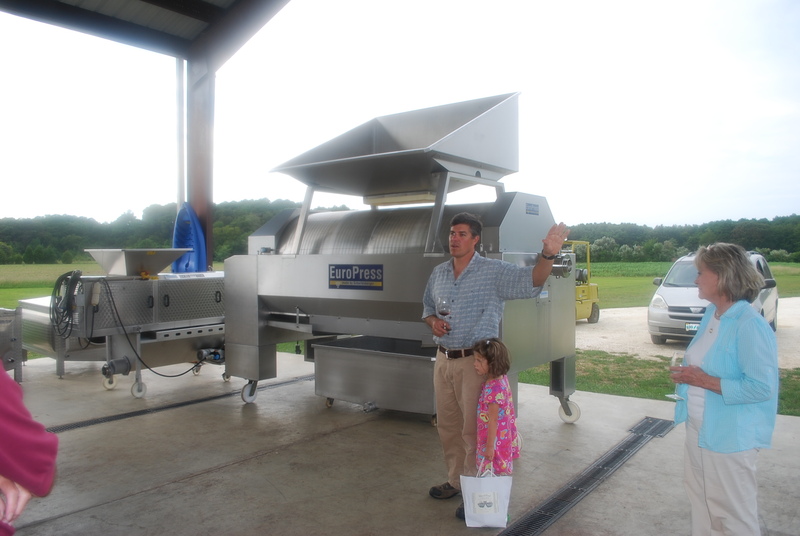 The first thing one notices is that wine grapes are quite small, much smaller than their kissing cousins, the “eating grapes” like Thompson seedless that one buys in a grocery store. 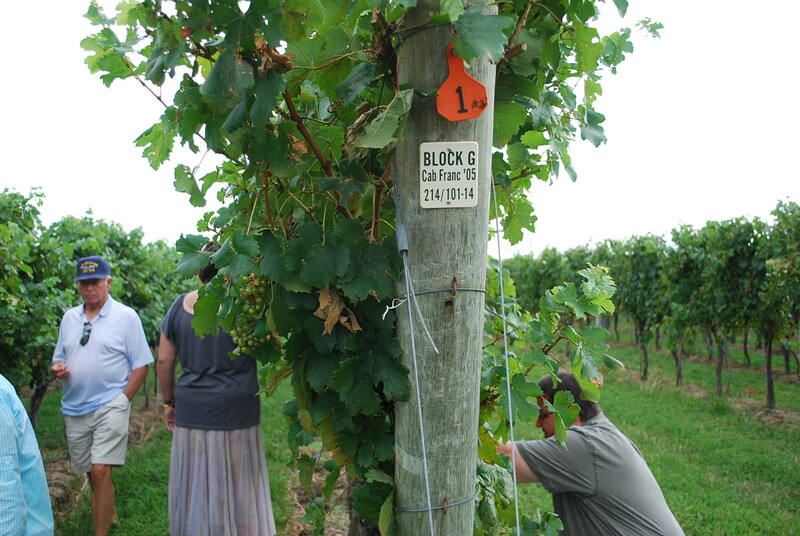 Chatham is currently growing about 20 acres of grapes, primarily Merlot, Cabernet Franc, Cabernet Sauvignon and Chardonnay varieties grown on French rootstock as well as a small section of Petit Verdot produced to provide extra color and complexity in blendings. 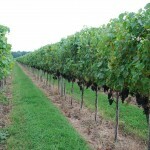 ( Especially in their Cabernet Franc which contains 3 % Petit Verdot.) 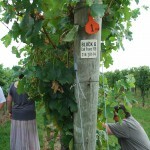 As we walked through the vineyard, Jon invited everybody to taste the various grape varieties, including different plantings of the same variety, all planted in rows which are oriented north- to- south for a more even ripening of the fruit. 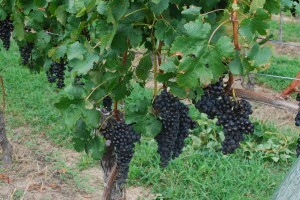 Although I much perfer a Cabernet wine to a Merlot, surprisingly, I that found that I preferred the flavor of the Merlot grape to that of the Cabernet grape. 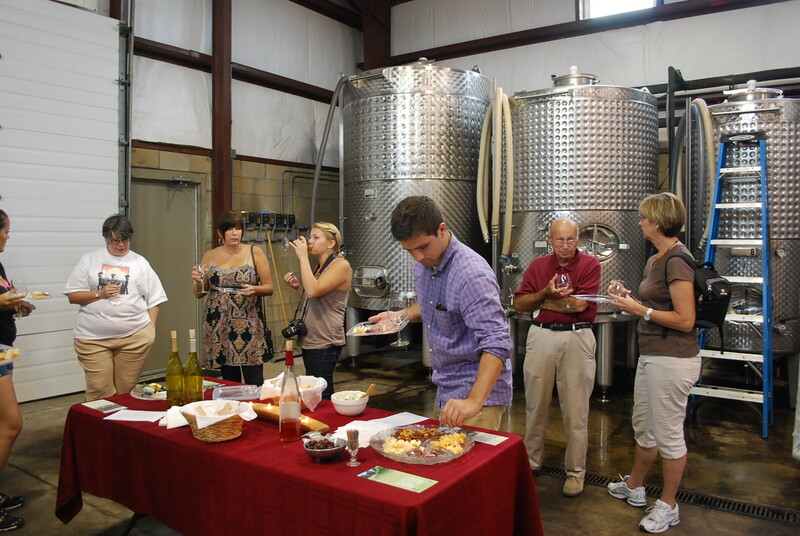 We learned about the “chewiness” of the grape skins, how to evaluate the ripeness of the grape seeds and how the immature tannins found in unripe seeds can adversely effect the wine. 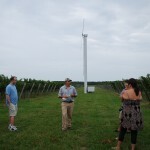 We admired the huge wind machine, very tall with long, tilted blades which can rotate 360 degrees, a newish invention which helps vineyards get through an early frost which could kill the new fruit buds by pushing the higher, warmer air down towards the cold air found near the ground, circulating it so that the coldest air doesn’t settle on the vines. 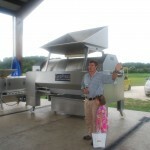 Jon says it works very well and has added a second wind machine to his official “Wish List”. 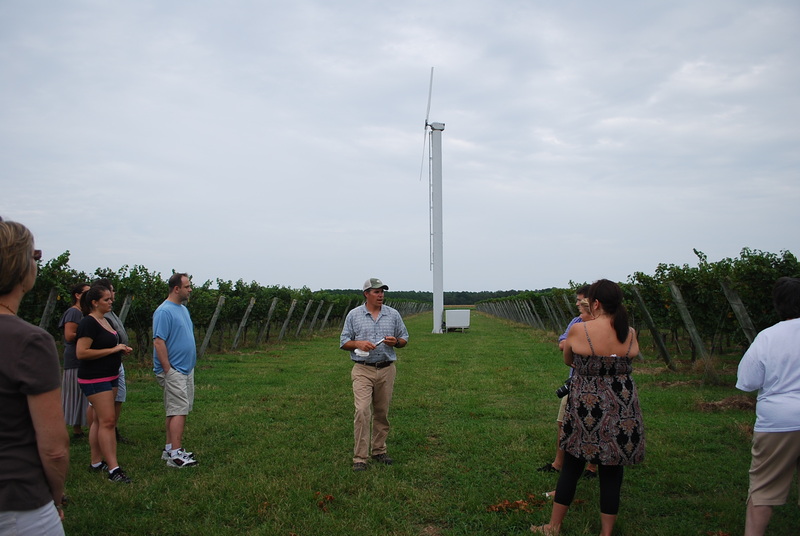 Part of a historic waterfront estate and started in 1999, Chatham uses a high density European trellis growing method and is now harvesting about 80 tons of grapes and producing about 3000-5000 bottles of wine each year. The moderate maritime climate here on Virginia’s Eastern Shore is similar to the climate found in Bordeaux, one of France’s most famous vineyard regions. 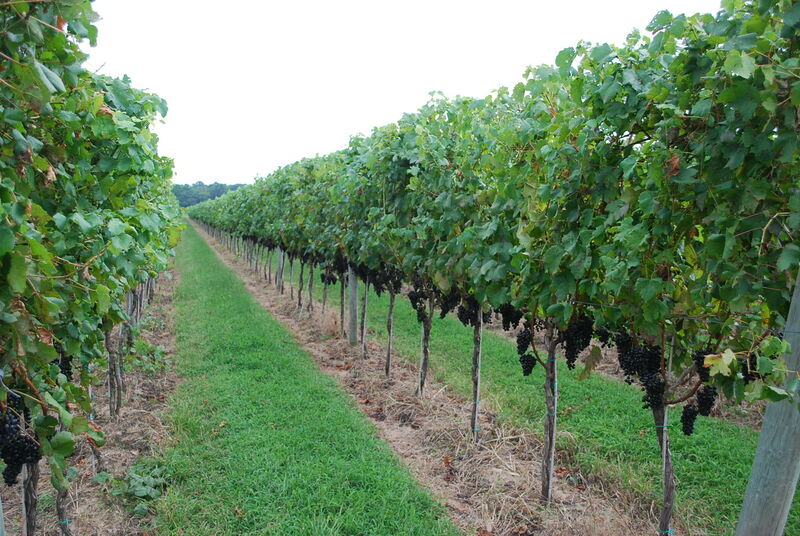 Our excellent climate, combined with the well drained loamy soils here in Northampton County, creates a good environment for producing top quality grapes needed for fine wines. 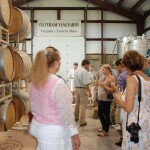 Chatham Vineyard has received a number of awards for various vintages and its wines are found in some of the finest Virginia restaurants and yes, I do know from personal experience that its wines make a very nice gift. 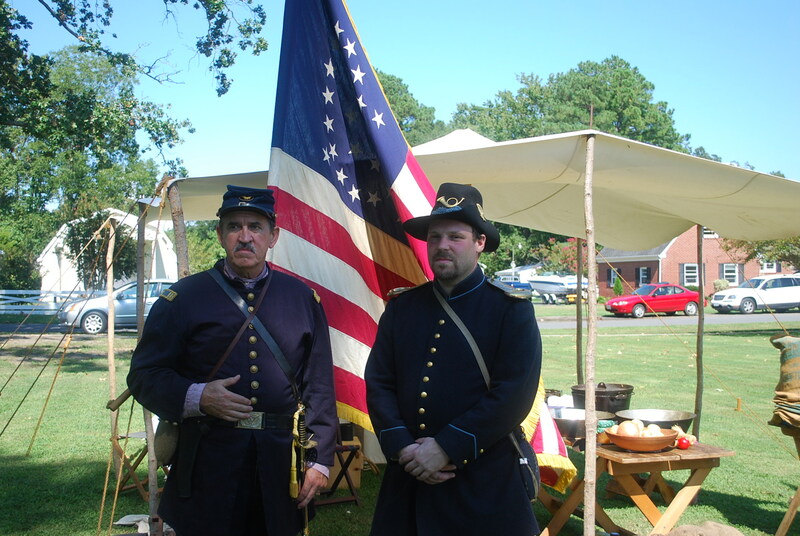 Kudos to the Eastern Shore Public Library for sponsoring last week-end what may be one of the Eastern Shore’s best events commemorating the Sesquicentennial, the 150th anniversary of the beginning of the Civil War. Hosted as part of Heritage Week by the small Eastern Shore town of Parksley, VA, a re-inactment camp of the Union Army’s 2nd Regiment Delaware Volunteer Infantry, which has been an active re-inactment group since 1988, was held on the grounds of Parksley’s Town Park. 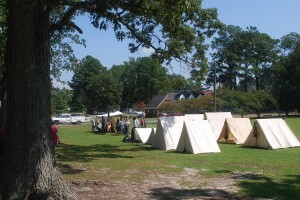 Led by Captain Glenn Layton of Wyoming, Delaware, who became a member in 1996, the Regiment’s authentic period white tents were pitched in large green spaces ringed by sturdy hardwood trees, their leafy branches providing much appreciated shade. This was a three day event starting Friday evening September 9th and continuing through Sunday afternoon on September 11th, with many planned activities including a short observance of the 10th anniversary of 9-11. The Saturday morning schedule included a presentation of general aspects of day- to- day army life including pay call, no doubt as important then as today. 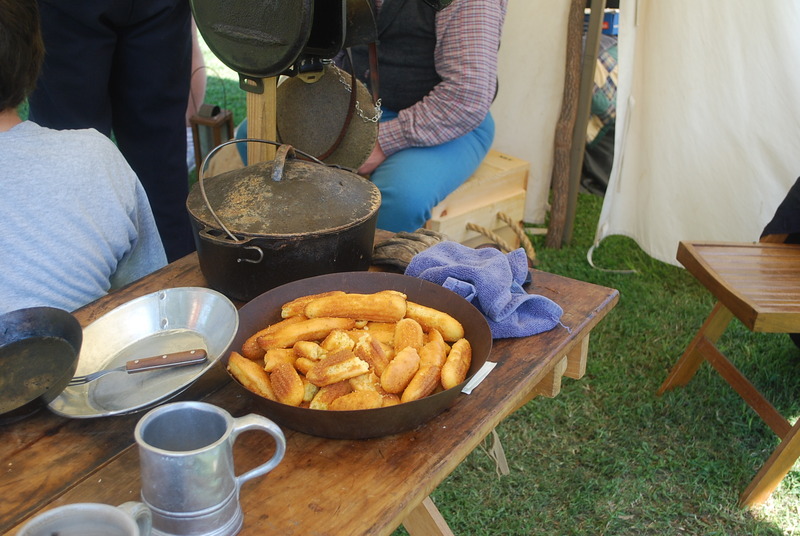 My husband and I arrived just before noon, in time to see the demonstration of period cooking. 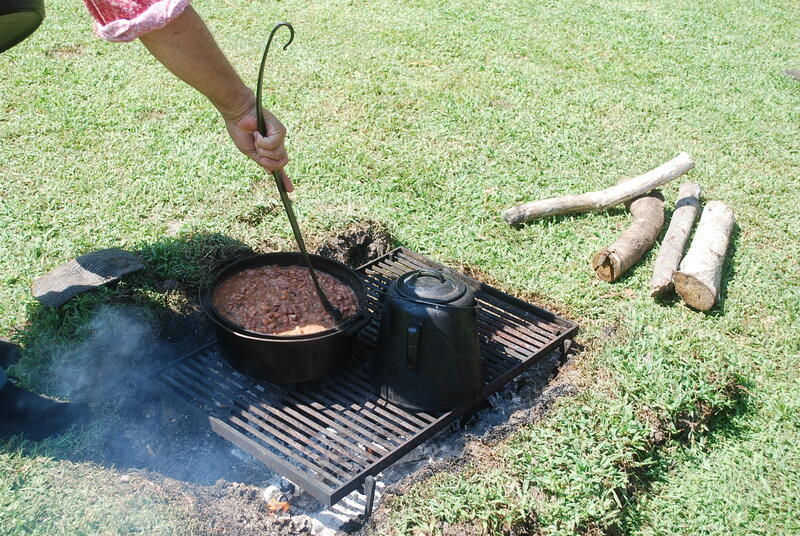 Lunch was being prepared in a large cast iron dutch oven centered over the glowing coals of a wood fire, a fine smelling stew of plump brown beans bubbling away in a sauce seasoned with onion and ham hocks to be served with corn bread, followed by fresh apples for dessert. 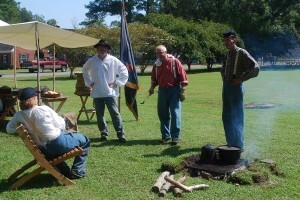 Troop satisfaction with the Company Cook seemed quite high and anticipatory speculation was circulating that roasted venison would be served for dinner along with a traditional apple crisp for dessert. 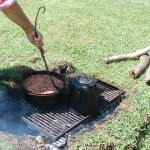 Beverages consisted of water from individual canteens or cups of coffee from the huge pot set at the edge of the fire, only period messware was used ( tin cups, plates and utensils) , not a single ice cold coke in sight. Shortly after lunch some close order drill and firing demonstrations were scheduled but before they began we were fortunate to be able to speak to the Company Historian, Private Sean Protas, who has forgotten more than I will ever learn about the 2nd Delaware and its various campaigns during the Civil War. At his day job, Sean Protas is an MBA and trust administrator. But by night, Private Protas is a diligent researcher, winkling out all sorts of interesting info on this Volunteer Regiment whose nickname was the ” Crazy Delaware’s” because of its unbelievable bravery and efforts to advance in the face of overwhelming odds at the Battle of Antietam. But some of the most interesting information about the 2nd Delaware to me was that the Regiment was involved in the Invasion of Accomac and Northampton Counties in November, 1861. Although I am not a Civil War buff, I was truly embarrassed that after all the years I have lived here that I had never learned about the Union Invasion and subsequent Occupation of the Eastern Shore of Virginia. 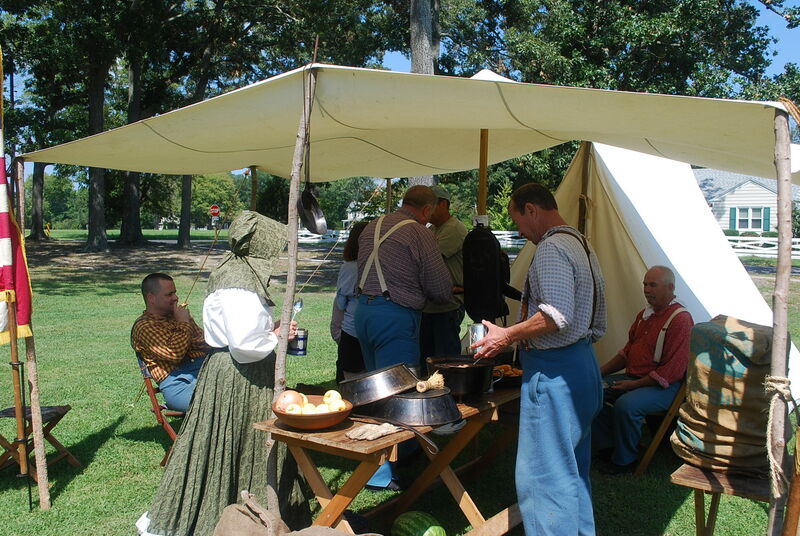 Preserving Civil War history through education is one of the primary goals of re-inactors and I surely got an education about the Civil War as it played out on the Eastern Shore by speaking with Private Protas. 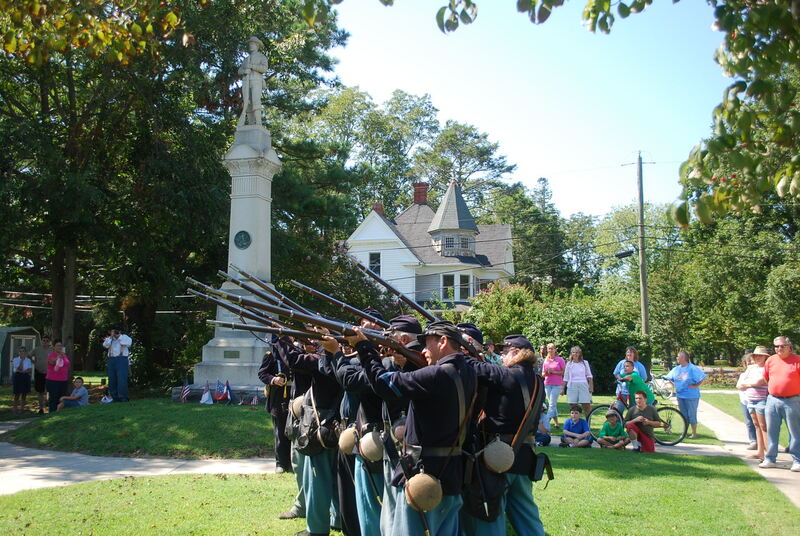 The Invasion began mid- November , 1861 and lasted for nearly a week, thereafter an occupation force of several thousand additional Volunteers from other newly trained units were moved to the Shore to maintain the peace. 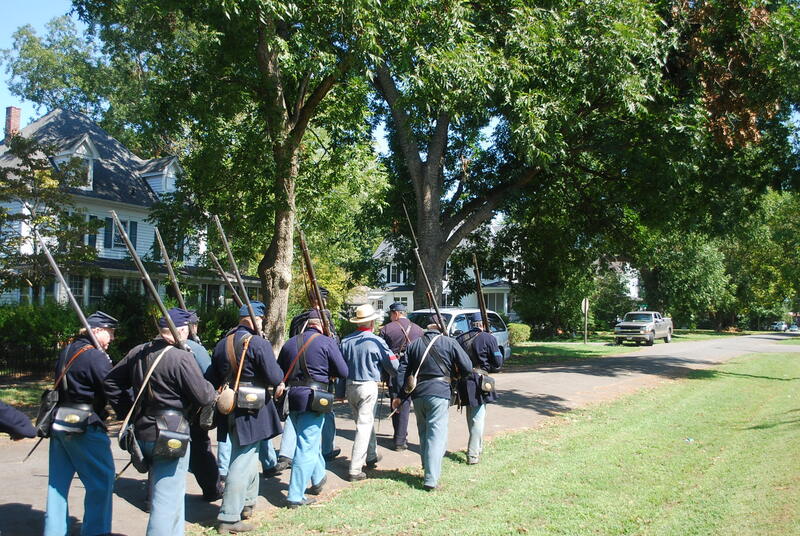 Union Regiments participating in the Invasion included the 5th New York, the 4th Wisconsin, 2nd Indiana and the 17th Massachusetts in addition to the 2nd Delaware. These units were selected because they had already had previous battle experience, being veterans of either the Battle of Bull Run or the Battle of Big Bethel. Although no Confederate troops had been stationed here, apparently the Shore was important to the Union army as part of its efforts to prevent easy travel to the south and to secure our many Atlantic Ocean and Chesapeake Bay inlets in order to blockade supplies to the Confederacy. So Pacification and Occupation of the Eastern Shore of Virginia was an important part of Union Army strategy. Makes sense, but who knew ? 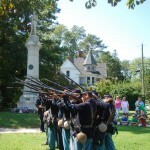 Two units from the 5th New York Regiment were even sent as far south as Cape Charles and beyond, although Camp Felicity, the Union Headquarters on the Eastern Shore, was located to the north on the Royal Felicity Farm, near what is now the town of Accomac, then called Drummondtown, relatively close to the Virginia-Maryland line. 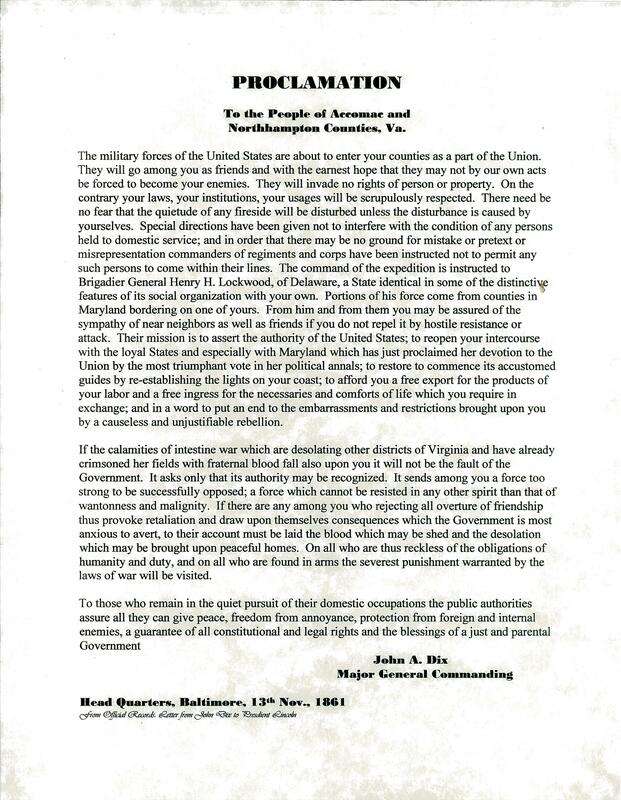 A Proclamation sent from Army Headquarters in Baltimore, Maryland, signed by Major General John A. Dix, was posted and read out in the Town Square, asking for Shore residents to co-operate with the Occupation, stating in part that unless the residents tried to repel the Army by “hostile resistance or attack” that “there need be no fear that the quietude of any fireside will be disturbed unless the disturbance is caused by yourselves.” Apparently it was obvious that the Occupation might be a lengthy one. Pvt. 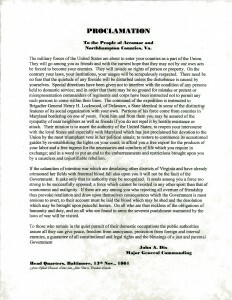 Protas gave me a copy of a letter written in December, 1861 from a Pvt. Brumley to his friend Eckel detailing life at Camp Felicity which comments: ” We shall soon have quite a society of ladies. The wife and daughter of our Colonial and the wife of one of the Captains are now in Camp. The Chaplain will soon have his family here. Then, with the 1200 men in barracks around us we shall form quite a village.” Apparently although some acts of rebellion occured and some tainted food was sold to Union soldiers, by and large, the Shore’s Occupation was without major incident, no doubt helping explain why the Eastern Shore still has so many historic homes dating back even to the 1700’s still standing . After the history lesson from Pvt. 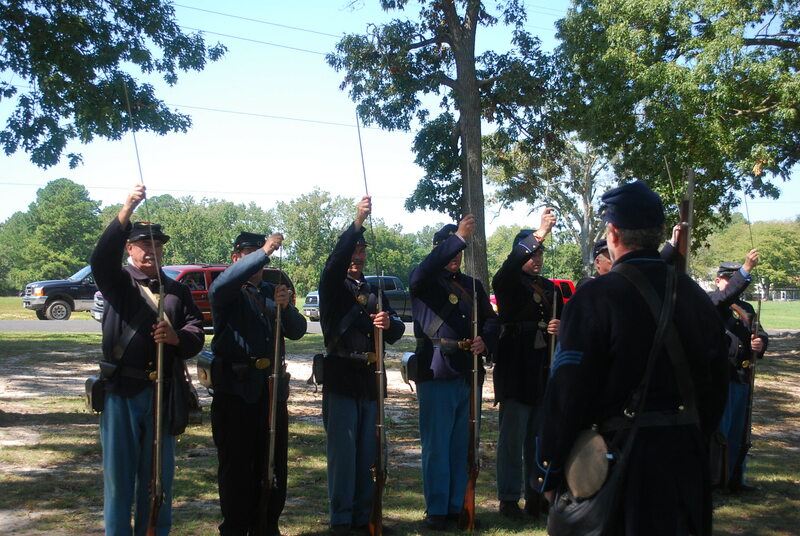 Protas, we went over to observe the drill demonstration and then the arms inspection which included affixing bayonets and preparing muskets for firing. 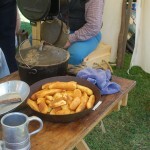 When watching these men tamp gunpowder into their muskets, one quickly realizes that many soldiers must have been shot during the extremely clumsy and slow process of simply re-loading. 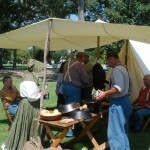 Just as the drill was being concluded, an unexpected and impromptu opportunity presented itself in the form of Confederate Commander Lowell Wallace of General Wises’ Refugees, a Son’s of Confederate Veterans group, which was staffing an information tent on the other side of the Park. 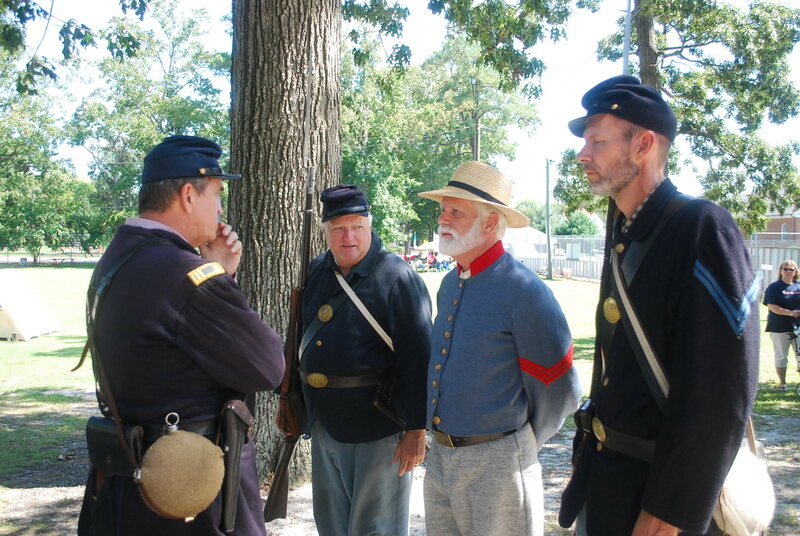 He came over and spoke to Captain Layton about re-inacting the seizing and handling of a Rebel prisoner from the local populace, the prisoner obviously being Wallace. So the prisoner Wallace was chastised for his misdeeds and then released by Captain Layton after swearing on his honor not do so again. 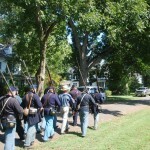 The entire Regiment, as well as Commander Wallace, then marched in close formation to the Confederate Monumont about three blocks away for a short ceremony honoring the dead on both sides and a 3 gun salute to the fallen. 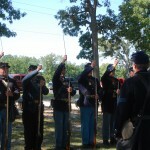 After marching back to the Park, the next item on the Regiment’s agenda was re-inactment of a Court Marshall proceeding, to be presented from information obtained from official records of the actual Court Marshall of a 2nd Delaware private who, in 1861, had left his post without permission. Unfortunately, we had another engagement and were unable to stay longer so I’ll never know the fate of that unfortunate fellow but I did learn so, so much else. It seems really remarkable when one thinks about it, that back in a period when most people, over the course of their entire lifetimes, never even traveled beyond the borders of their own state, many never even beyond the borders of their own county, to have young men, Union soldiers, sent to fight on the tiny Eastern Shore of Virginia from such faraway states as Wisconsin and Indiana, New York and Massachusetts. And Delaware. E Pluribus Unum. You are currently browsing the Life and Real Estate on the Eastern Shore of Virginia blog archives for September, 2011.